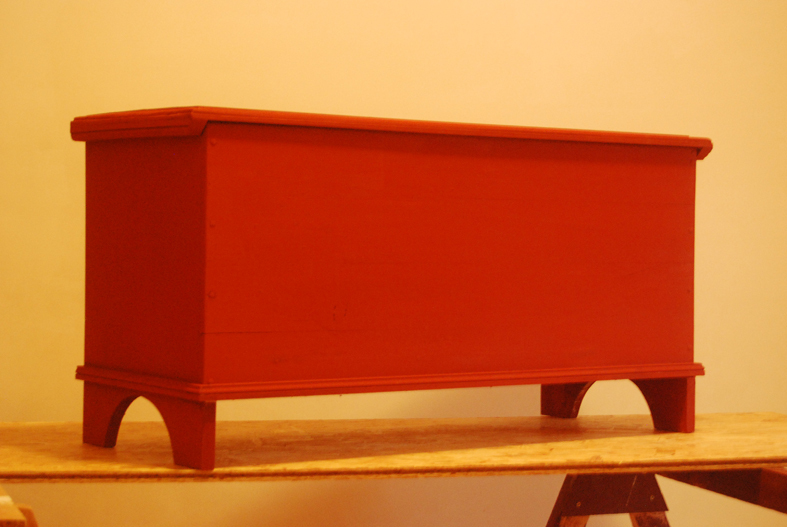 Despite word from Tibet from my milk paint supplier that Agnes the yak was busy assembling her hope chest and flirting shamelessly with a certain strapping young specimen of yakhood, I decided that I needed to take the bull by the horns and get on with painting my six-board chest. Vinegar, skim milk, a stainless soup pan, spaghetti strainer and a measuring cup. I poured a liter (quart) of skim milk into the soup pan, let it warm on very low heat to the point where there were just the faintest hints of steam coming off it, and then added 4 cl (1.5 fluid ounces) of vinegar –stirring a few swipes, enough to mix, but no more. 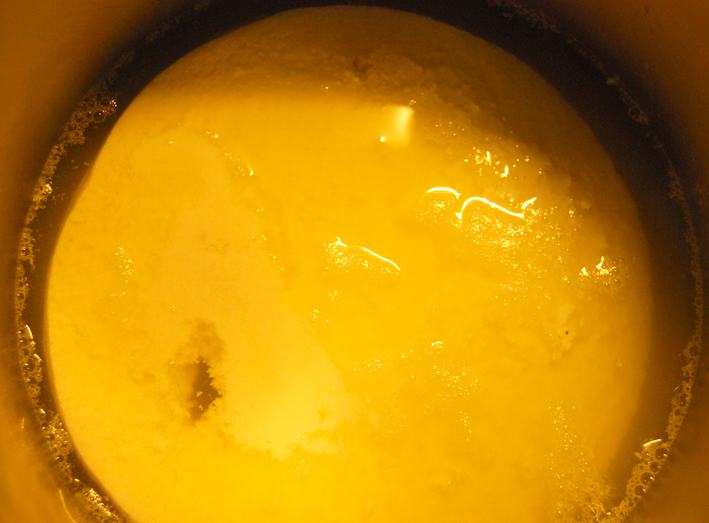 This is not a critical thing, the curds will form in one way or another. You can even just let it sit at room temperature, but that will take hours. The important thing is not to bring the mix to a boil. I did this twice, and the second time I ended up with much less cohesive curds. No matter. After washing, it looked the same. If you substitute whole milk and maybe a little cream, and lemon juice in place of the vinegar, the same process will yield a fabulous farmer’s (or ricotta or quark if you want to be fancy about it) cheese. The finished cottage cheese, cement/lime-mortar pigment, and hydraulic lime. You pour out the “cottage cheese” into a strainer lined with cotton cloth, and then rinse it under cold water two or three times. 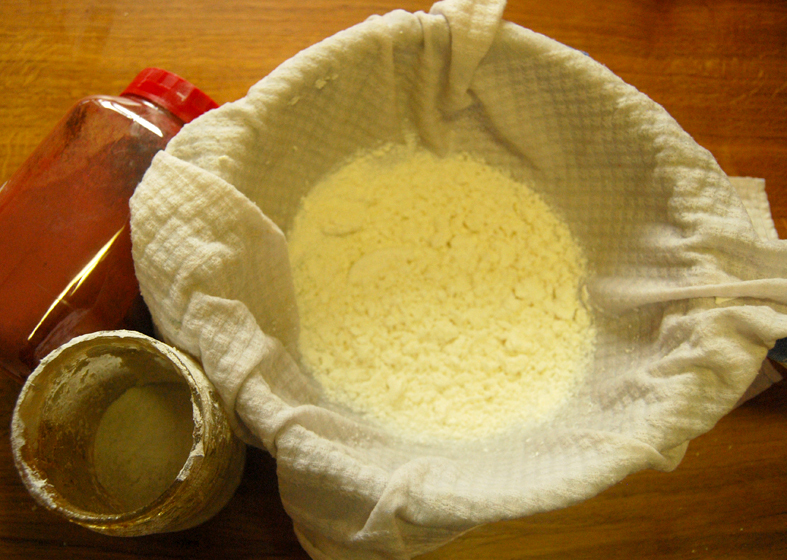 Given that vinegar is an acid used to curdle the casein milk protein and separate it from the whey, this is an important step in that a basic powder in the form of slaked lime or chalk is often added to the cheese, which if not rinsed could cause a chemical reaction that would spoil the mix, at least. Then I added water to a handful of slaked lime with a couple of pinches of borax mixed in. In place of the slaked lime, you could use various kinds of finely ground chalk powder, or nothing. The lime or chalk powder is a filler, and results in a more pastel color. But some just add the pigment directly to the cheese and go from there. The borax is to help break down the casein protein in the fresh cheese, increase the adhesiveness of the paint, and adds some anti-microbial protection. It took a while to mix all of the lumps out. Would have gone faster with an electric mixer, but that would have been too much for even my remarkably tolerant better half. “Darling, you know I love it when you whip up a new recipe, but if you even think about serving rusty nails and hinges braised in vinegar this evening, you will be sleeping in the rabbit hutch tonight.” We don’t have a doghouse. The other thing was I used a natural hydraulic lime, NHL3.5, instead of the non-hydraulic lime usually recommended, because that was what I had. It worked OK, but you have to use the paint quickly and stir often because the lime will start into its hydraulic set after a while, and the paint becomes useless. The chest after two coats. It doesn’t show in the photo, but I used a little more lime and a little less pigment for the second coat and it gave the chest the slightly two-toned look I was aiming for. 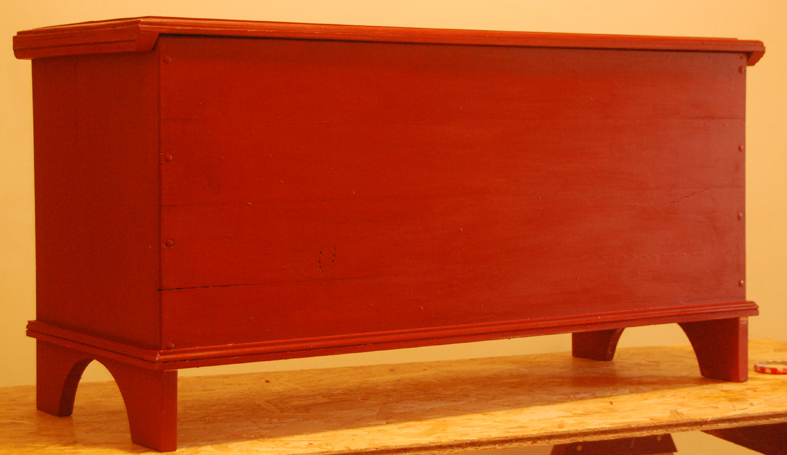 Mostly people use linseed oil for a topcoat over the milk paint to give it a little depth and a slight gloss. I wanted to finish the inside of the chest, too. You can’t use linseed oil inside a chest, especially one that will be used to hold clothes or linens, because it starts to stink after a while. So I opted for some lovely natural shellac I picked up a while back. Just the ticket. 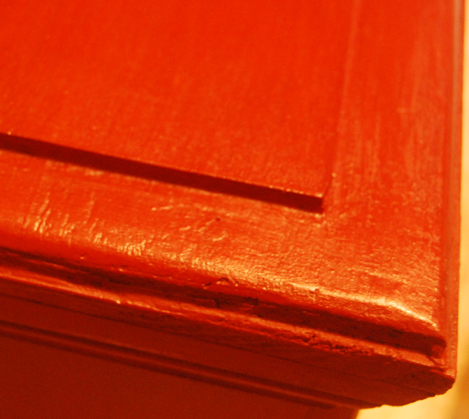 Very slight gloss, nicely highlighting the cross-grain tear-out from the moulding plane. Whoops. All in all a good experiment. Start to finish, making the paint is about a 20-minute process. There are a number of recipes online. Lots of different permutations, but the upshot is that it really isn’t that critical what you do or which ingredients/quantities you opt for, as long as you make enough for the whole job, or are looking for the slightly two-tone effect. This entry was posted in Grandpa's Workshop, Mouldings in Practice. Bookmark the permalink. This is way cool. What am I doing with my life? Wow! Making your own milk paint. That’s a level of dedication/insanity that I don’t think I’m capable of. Congratulations! Awesome! I love the look. Yaks be damned, that was a great write up. has a recipe for milk paint. Thirdly, getting back to the first point, cooking is a pleasure and a gift, as is woodworking. Baking an apple custard pie from scratch is twice as complicated than this. It really is a 20 minute deal. What did you use for pigment? I have tried copper sulfate(nice light blue that turns green over time), and aniline dyes, without pigment you get a nice semi transparent white. 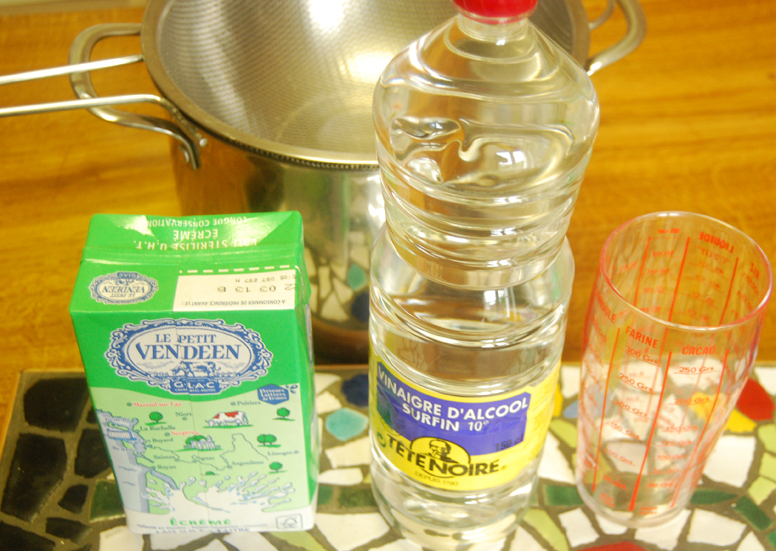 I just left the milk to stand until it reached room temperature before I added the vinegar which yielded nice curds. Blue chalk from a chalk line? Yea, I’m making some of this. Got family, nieces and nephews that will love the project. And, seconding Mike Siemsen, what did you use for pigment? Thanks for making me feel like a lazy sod…I have in front of me the color sticks from realmilkpaint.com as I try to decide what color(s) to order for my ATC. 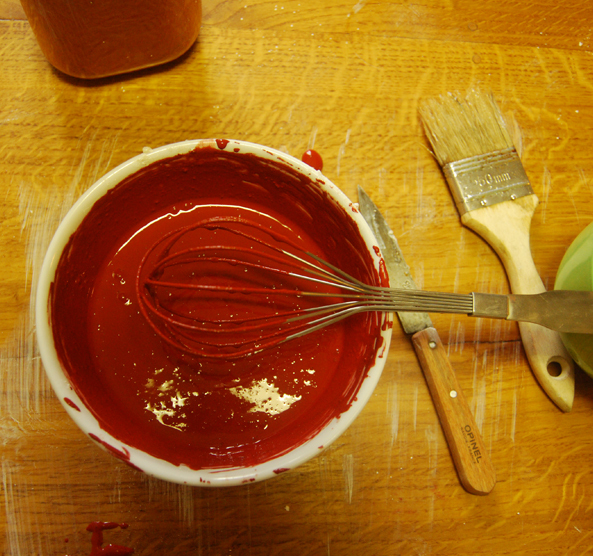 The other option is to make your own paint from linseed oil, pigment and Japan Drier. That’s the recipe that Jennie Alexander and Peter Follansbee use. Looks great in my opinion. And no cooking equipment is harmed in the process. Oh, I am so down with this. And I’ve already got a pound of iron oxide (brick red). The (sort of) amusing thing about this is that if one wants to make a historically-accurate bright red paint, the pigment in use during the eighteenth century was mecurial oxide (red oxide of mercury). That ingredient isn’t exactly compatible with cooking equipment (at least that’s going to be used again for food!). Hmm, use that tainted cooking equipment to mix up some grub for your worst enemy, or mother-in-law. Bioshieldpaint.com sells both earth pigments and Spinell pigments. I used red Sika cement/lime mortar pigment. Synthetic iron oxide. Not something to spread on your breakfast cereal, but if you clean the bowl and the whisk, shouldn’t be any problem. At first, I thought we were gonna make a wooden cheese press! Very interesting process here.. If you want to make your own casein (milk) paint, take a look at this 1905 German book (translated into English in 1906), Casein: Its Technical Preparation And Utilisation, by Robert Scherich. Lots of detail on how to make milk paint. Yep, this is the simplest recipe and the one i’ve been using. I don’t use borax though. The hydrated lime is necessary I believe to bind the pigment to the casein. Its really not that hard folks, so give it a try! I’d like to make my own lead paint, so if your up for that, give us a tutorial! Thanks!